Something completely out of the blue I know but I could not resist it! I have an occasional interest in the 18th century - mainly due to Charge! if I am honest - and this has tended in the past to be mainly Seven Years War in Europe based with the occasional foray into the American Revolution. However, I have recently been revisiting the campaigns on the 'fringes of Empire' if you like, namely the French and Indian War and also the wars in India. I am very fond of Stuart Reid's titles and so when the above was advertised I was always going to buy the same. 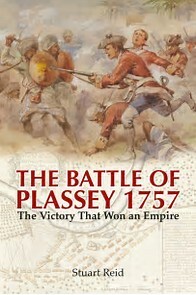 The Battle of Plassey was the battle that cemented Great Britain's place as the upcoming premier power on the subcontinent and made the fortune of Robert Clive, one of my historical interests alongside T.E. Lawrence and others. The book follows the usual Reid template with notes etc at the end of each chapter and an easy, readable writing style. I am going to savour this and will probably revisit Robert Harvey's excellent biography of Clive as a result. Would I ever game the period? I doubt it as to do it just would require far more time and effort to produce armies for this than I would be prepared to devote but I would certainly consider a board game on the period if such existed. From the gaming perspective the man cave will be changing slightly as due to the new kitchen I now have a new table measuring 5ft by 3ft with a leg at each corner rather than the old drop leaf version currently in use. As anyone with a drop leaf table will know you are a little restricted for storage underneath so the new single piece table is most welcome. It does mean I will have a 5 ft by 3ft piece of MDF spare should anyone want the same. I am planning to make the change over this weekend. I took delivery of a copy of the operational scale WW2 rules by Sam Mustapha and whilst I have not had the chance to read them in great detail seem to have ticked an awful lot of my personal gaming boxes. They are square grid based which will suit me down to the ground especially for the scale I will be using - 1/600th or 3mm if you prefer. The game uses a 6ft by 4ft table divided into 6" squares meaning a grid of 8 x 12. Now I own (and both have featured on the blog in use) a couple of 3ft by 2ft game boards gridded with 3" squares - exactly the same as the bigger version described in the rules. A 3" square looks fine with the 3mm models deployed therein especially as my plan is to base the models for use with Command and Colours as well. This means a typical tank unit will have 3 bases whilst infantry have 4 and artillery 2. Using these bases will enable the models to deployed far more aesthetically within a square than using a single large base. Am I excited about this set of rules? Absolutely! I have been waiting for something like this for a while and although I have seen and experimented with a couple of other similarly scaled sets I have yet to find the right fit. I am hoping this will be the one. I start my new job this coming Thursday and although I was trying to secure something local it did not work out as I had hoped. This means I shall once again be on the commute but luckily the hours are a little kinder so at least I will have some extra time during the week. If I am honest I will be glad to get back to work for a rest! On the gaming front I finally managed to tidy and rearrange the man cave - this was long overdue - so I am hoping to get some games in once again. These will be using the block armies initially and I suspect that the Portable Wargame will feature in some fashion. There are a few other things on the go that may appear but not for a while yet. On the boot sale front I managed to score a large bag of balsa wood for £1.50 with some very useful pieces. I am looking at knocking up a selection of generic warship types for the Red Sea/Indian Ocean during the Great War. This will mean older, second line cruisers, gunboats, AMCs and Dhows. Lots of Dhows. I already have a set of rules in mind for the naval aspect of the project and hope to flesh this out further once I am closer to gaming it. The models will be made on a 'cartoon' basis with the largest type coming in at around 8 cms long - large enough to fit on a couple of Heroscape tiles.